from tuesday, 23rd of April until friday, 26th of April office will be closed due Easter break. For dental emergencies (tuesday through to thursday) please call: Zahnärztin Dr Pia Mocker, Zimmermannstr. 34, 12163 Berlin, phone: (030) 797 000 34. For dental emergencies in Berlin on weekends and bank holidays / Easter please call: (030) 89004 – 333 or check the worldwideweb: www.kzv-berlin.de , box in middle right: “Notdienst”. From monday, 29th of April we are back in office – regular opening hours. We wish you and your families a pleasant, relaxing and spiritual Easter break. Please note when scheduling treatment appointments with us that we are well booked in advance for more complex treatment appointments but also simple “check-ups”. For emergencies we are of course right there for you – even on the same day of call if preferred (waiting time in the office required). Reminder : 12th of May 2018 was the European Day for the fight against gum disease (Periodontitis). 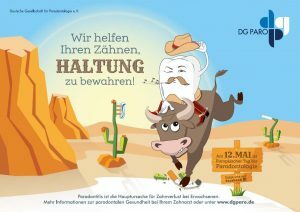 Get yourself informed about gum disease, check your own risk for example on the website of the German society for Periodontology www.dgparo.de or the European Society for Periodontology (EFP) www.efp.org or just simply ask us.